Trump claims to be very successful, a great winner who’ll make America dominate global markets again. He asserts this even though we continue to lead the world in power, influence and GDP by a huge margin. He makes these claims in dismissal of the fact that our economic situation is radically better now than during the harsh years immediately after the 2007-2008 financial crash. He promises to bring much expanded prosperity and stability for citizens at all socioeconomic levels. But, how often has Trump legitimately succeeded in his career? What evidence is there to demonstrate his expertise with money management? Does Trump’s performance as a leader inspire trust and praise from his former employees and business associates? How often has he won? Time Magazine laid out the categories where success evaded him: Trump Airlines, Trump Vodka, Trump Mortgage, Trump: The Game, The China Connection, Trump Casinos, Trump Steak, Trump Magazine, GoTrump.com, Trump University. On similar points, CNN has put together a short video collection that includes some of his business failures titled, “Trump’s 4 Business Bankruptcies in 2 Minutes”. To elaborate on just one example of his terrible mismanagement, consider the company he started to absorb the losses for his failing casinos in Atlantic City. Between 1995 and 2009, the average investor in this organization experienced a massive loss from $35.50 per share down to $0.17. Many contractors were not compensated for their work and casino bondholders lost a tremendous amount of money. Trump pocketed $45 million during this period. Many public testimonies attest to his shady service offerings to “help” others get rich by applying his alleged genius entrepreneurial skills. He expects the voters to find his wealth impressive after receiving a $1 million loan from his father and $40-200 million inheritance and his father’s connections in the same industry. They both saved hundreds of millions through governmental financing programs. He acts like he supports the average person’s monetary success while officially submitting a future tax policy that disproportionately benefits the super-rich. 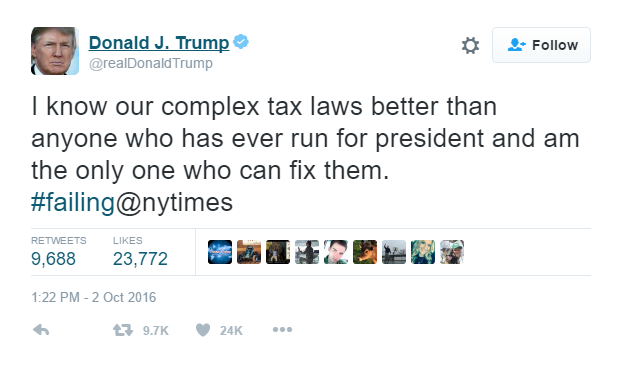 This fits neatly with his refusal throughout the campaign to release his tax returns, his stated reason being that he couldn’t do it until a routine audit was complete. To the contrary, the IRS stated there was no legal restriction preventing him from sharing this paperwork with the public and his own lawyers communicated that a half decade of returns from the mid-2000s could be shared in the meantime. When his 1995 state tax return was leaked in early October 2016, the voters got a shocking preview of what the rest of Trump’s hidden finances might look like. Personally he had lost $900 million in just one year. “An investigation of the foundation — including examinations of 17 years of tax filings and interviews with more than 200 individuals or groups listed as donors or beneficiaries — found that it collects and spends money in a very unusual manner….For one thing, nearly all of its money comes from people other than Trump. In tax records, the last gift from Trump was in 2008. Since then, all of the donations have been other people’s money — an arrangement that experts say is almost unheard of for a family foundation….Money from the Trump Foundation has also been used for political purposes, which is against the law. The Washington Post reported this month that Trump paid a penalty this year to the Internal Revenue Service for a 2013 donation in which the foundation gave $25,000 to a campaign group affiliated with Florida Attorney General Pamela Bondi (R)…. Great post! How in the hell did we get here? Are people so blind that this information doesn’t bother them? I think the fact that we were about to elect our first woman president had a lot to do with the outcome. These goofballs in their huuge pick up trucks and tiny dicks couldn’t handle having a woman in charge. They just had a black man in office for eight years, and their heads were going to explode if Cheeto Jesus didn’t get elected. They are doing a recount in my home state of Wisconsin as we speak. I’m glad it’s happening, and of course Trump is saying it’s a scam. I just hope we all survive the next four years, with our lives and retirement accounts intact. We can keep trying to talk with people about what we think are sensible views of politics and the world at large. There are moderates who will listen. I know this from experience. Unfortunately, there were millions of Americans who stuck their fingers in their ears and hummed the theme to Jeopardy when deciding who to vote for in this election. Some of them I talked to didn’t want to have a sensible discussion. The believed every word the Republican propaganda machine has been spitting out for the last four years. Many of them never watched a single debate or tried to educate themselves one iota on the issues facing our country. Trump played them like a finely tuned fiddle. Donald Trump is a Micro-Guy in a Macro-World. The business–Trump Organization, LLC–that he inherited is a family-owned dictatorship. No board, no shareholders, just Donnie and the trumpets. But, now he’s in over his head. He makes decision on an ideological basis, rather than a sane one. As long as it makes him “Right”, so what if it harms someone, breaks the budget, de-regulates the banks, a la 2008. DON-NIE, DON-NIE, DON-NIE! This is precisely the type of Genius that called the head of there Park Service, directing him to get photos of he overwhelming mass of media that was watching his Inauguration. He’s got this guy chasing rainbows and measuring shadows. The crowd that he’s looking for–their all down in Mexico, laughing ther rear-ends off. I particularly like your choice of various topics. I’ll be back!